We had our first “felt like fall” weekend where our overnight temperatures fell into the 30s. Luckily for us, we had no frost and stayed toward the upper end of the temperature range. Still, it was a chilly, crisp weekend. As much as I love the promise and excitement that comes with the first warm days of spring, I find the crystal clear skies and nip of a fall breeze invigorating. 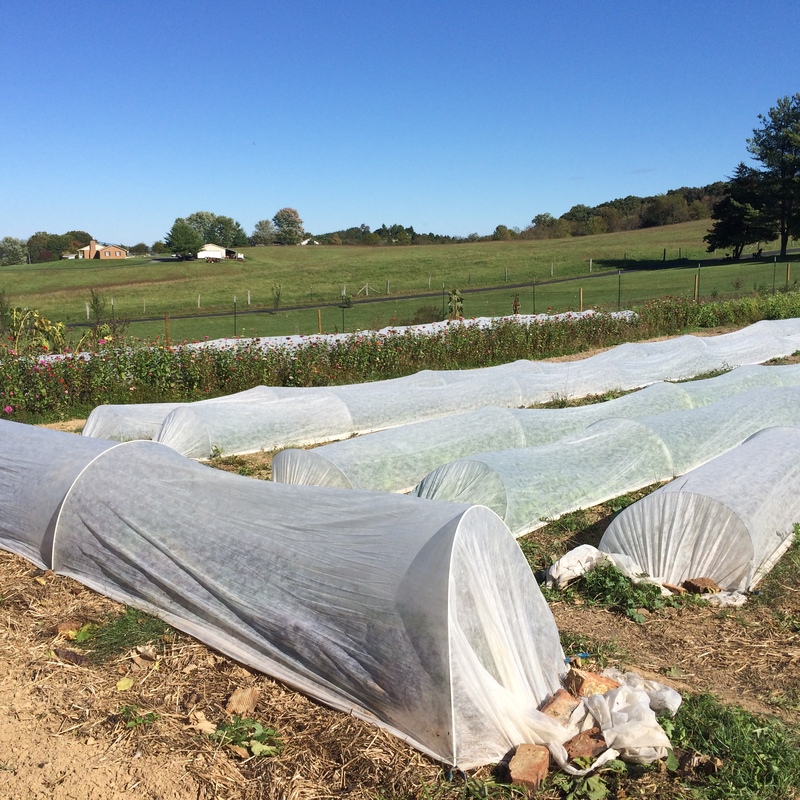 We had a busy weekend that mixed business and pleasure (market day and winery tour with friends), but we were able to protect a good many of our crops for that “just in case” possibility of a killing frost. Farming on a ridge with some (usually) stout westerly winds can be a challenge weather-wise. These covered rows contain lettuce mescluns, mustard mesclun, radishes, turnips, head lettuces and beyond the row of zinnias (just can just see the tops of more row covers) are the greens (bok choy, Chinese lettuce (which is a cabbage), tatsoi, kales, collards, chards, arugulas). At any rate, with the weather warming up again this week, I have a little more time to deal with what is still growing in our fields. Our average first frost date is October 15th for our area. The clock is ticking! It is time to get busy in the kitchen and do some more preserving of veggies! As you can see in the back ground (behind the shed) there are just a few covered rows (green beans) surrounded by a lot of nothing. The bare spots have been seeded with a cover crop mix (oat and Australian Winter Pea). After tomorrow’s market, any beans that are harvested will be canned. In the foreground are still very lush rows of carrots and beets. These rows will get mulched and row covered with hopes of over-wintering these crops for continued good eats. To the left of the shed and that bare ground are the peppers and herbs. They are un-protected at the moment (had me holding my breath this weekend). I will start harvesting the hot and bell peppers throughout this and the following weeks and begin drying, freezing and canning. 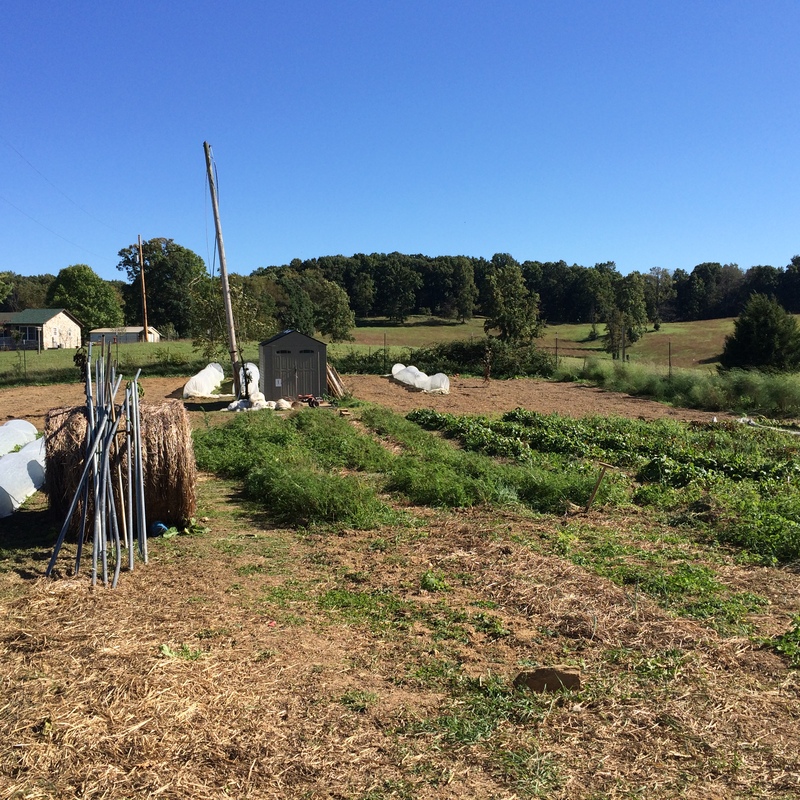 Eventually, that whole side of the garden will be in cover crop (I hope) and the front half will continue in production through the fall/winter. Finally, our front yard has some contour rows that contain our fall planting of potatoes. They’ll get a nice, thick layer of straw mulch for over-winter protection. We had potatoes all last year, and it was wonderful to just go outside and dig up what we needed when we needed! As for our market season, we are excited to head to our favorite community venue tomorrow (Oct 7th) – the Pulaski train depot. Our friends at the Pulaski County Chamber of Commerce are hosting a Harvest Craft Fair with a ton of vendors (including PTHF). There will be music, food and fun from 4 – 8. This event will mark our final official setup for the season, though we welcome anyone out to the farm if there is something you crave. I will keep posting under our Current Harvest Tab and on Facebook what we have growing. We also hope to keep up some deliveries to Annie Kay’s in Blacksburg. So – that is what’s happening in the garden at the moment. Many thanks to our volunteers who came out yesterday to help with some of the cleanup (of finished summer crops) and weeding. Always amazing how much gets done when there are a couple of extra pairs of hands around. Hope everyone was able to enjoy the beautiful weekend and the lovely display of fall colors happening to our trees.